Audi is set to replace the current A7 with a new version for 2017 and the new version will be improved on compared to the current model of the car. The new A7 is codenamed C8 and it is expected to be offered with several engine choices. One of those options will be a 2.0L 252hp four that is already on offer in Europe. The next A7 is expected to be offered with a 326hp version of that engine using e-boost. The highest performance version of the car is tipped to get a tuned version of the Audi 3.0L V6 turbo engine putting out 575hp. That 575hp version is expected to be the RS 7 version of the car. Drivers preferring diesel power will have an optional 350 hp oil burner. 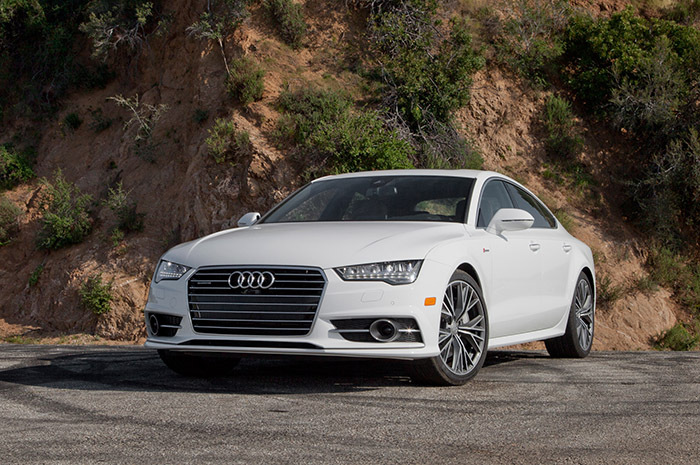 Hybrid versions of the A7 are also tipped with turbo 4 or V6 engines. Along with new power options, the 2017 A7 is also expected to get a lower and wider stance. It is tipped to stick closely to the styling of the 5-door fastback concept. Inside the car is expected to offer touchscreen controls and programmable full-color screens for main instrument and night vision for driving at night.